My paintings have been described as “realistic impressionism,” always searching for beauty in colours. I paint daily, always changing subject matter and using all media to keep a fresh outlook. I especially like to create unique collages. Born in Belgium, Emmy later lived in Holland for 3 years, where she began her art studies. Emmy moved to Canada in 1951 and continued her interst in art and studied whenever there was an opportunity. She lived in BC until 1961 and in kelowna from 1955-1961. She moved to Ontario and returned to Kelowna in 196. She has travelled extensively in EUrope, the Middle East and the Far East. The influence of these destinations can often be seen in her work. While I have dabbled in various forms of creative expression over the years, including drama, photography, collage and oils, the opportunity to explore my inner artist expanded after my move to Kelowna in 2007. My work now is primarily contemporary or abstract in acrylics and mixed media. My process has evolved with time and experimentation, enriched through classes with various instructors, interaction with other artists and participation in painting groups and shows. In my journey of discovery, I continue to move to a freer style with less concern about realism. Increasingly, my work is a study in colour. Though I enjoy challenging my own assumptions and pushing the boundaries of my skill and technique, my fundamental purpose is to give pleasure to, rather than challenge, those who view my work. It gives me great joy when, through the process, I am able to connect with those who experience my creations! The connection completes the circle! Tatianna O’Donell – Artist StatementThis series explores the relationship of trees in our threatened wilderness and the ephemeral quality of our own lives. 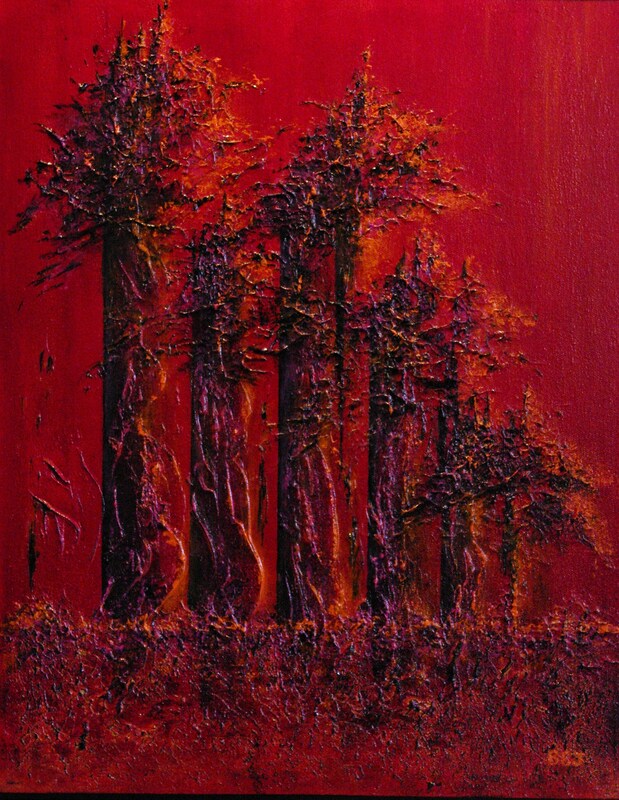 The trees in this series are painted with the branches and occasionally foliage above ground and the roots below or just above ground. 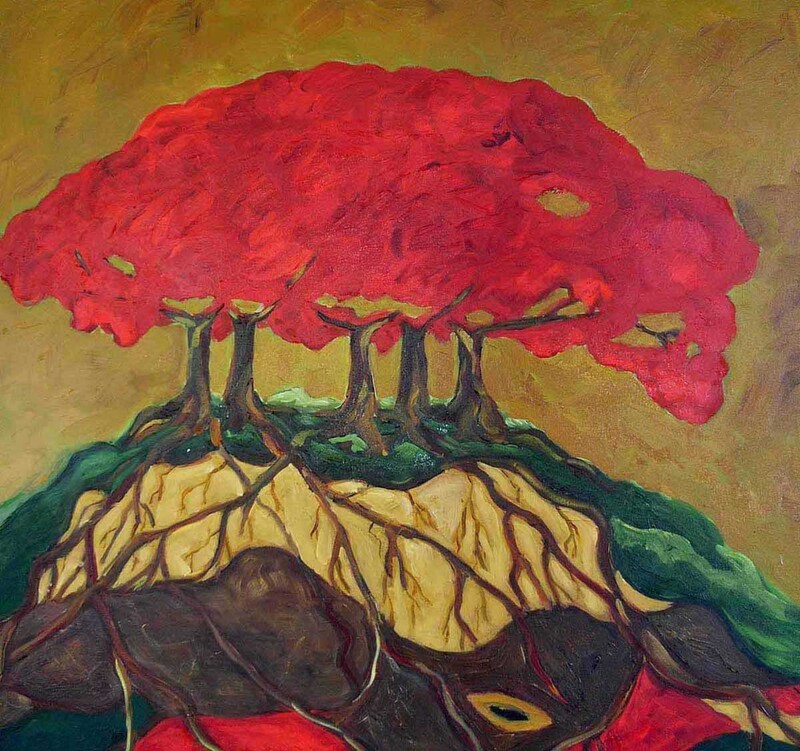 I like to depict the roots – the way they hang on to the rocks of the mountains or twist above the soil. These are symbolic of the roots, which connect us all to our past, and to each other. There is interdependence between man and nature. 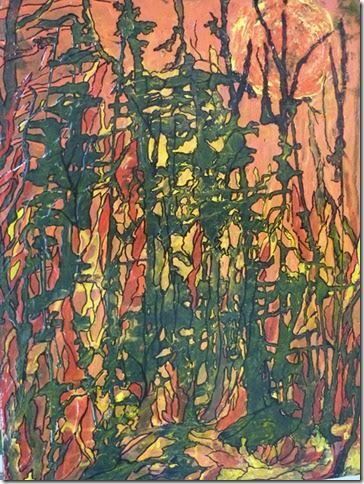 This series is a statement about the endangered environment; the diminishing forests; the threatened wilderness.I approach my work intuitively, using sketches and photographs as a basis for my painting. I am interested in interpreting the rhythm and soul of the tree. The spirit of the tree comes with me into my studio and is translated onto the canvas using oil paint. It is an exploration of shape, contour, line and texture. My works make reference to the cycle of birth, death and re-birth in life. 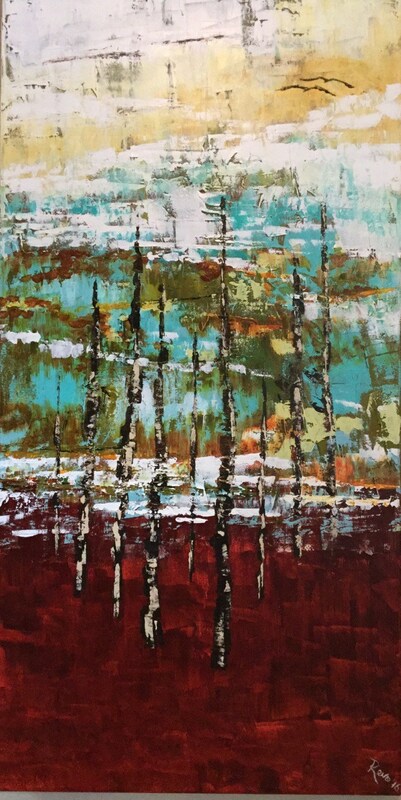 Although I explore other themes and work on other series, I find that the Trees and Roots draw me back regularly. Artscape is an exhibition program dedicated to providing local professional and emerging artists with year-round, special exhibitions, high profile showcase locations, and marketing opportunities.